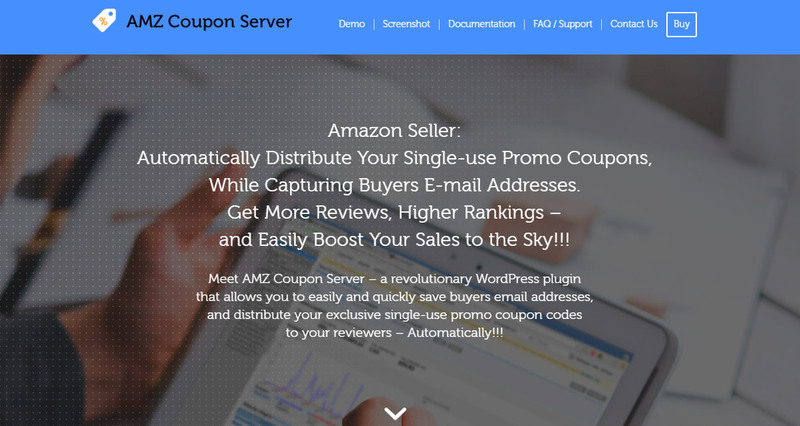 Meet AMZ Coupon Server – a revolutionary WordPress plugin that allows you to easily and quickly save buyers email addresses, and distribute your exclusive single-use promo coupon codes to your reviewers – Automatically!!! 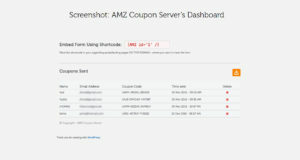 AMZ Coupon Server captures buyers email addresses – Every buyer will automatically get his exclusive, unique single-use coupon to his email. Every buyer can use his discount only once! 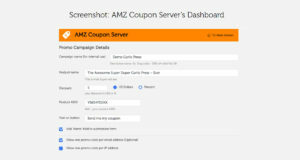 With AMZ Coupon Server,your inventory is safe and protected! 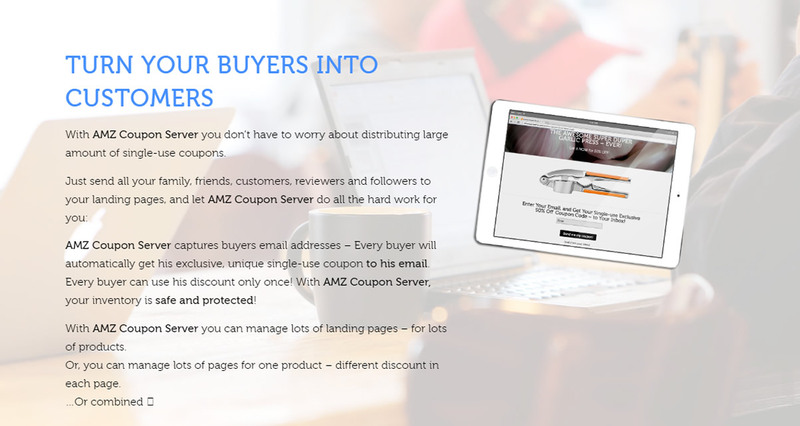 With AMZ Coupon Server you can manage lots of landing pages – for lots of products. Or, you can manage lots of pages for one product – different discount in each page. He enters his name and email, and clicks Send. Drive more traffic to increase sales – Get More Reviews, Higher Rankings, and Easily Boost Your Sales. 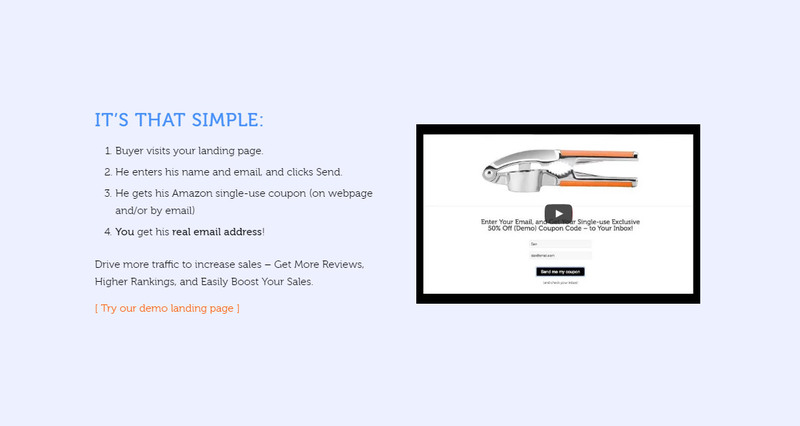 Automatically distribute hundreds and thousands of single-use Amazon coupons – for reviewers, clients and friends. 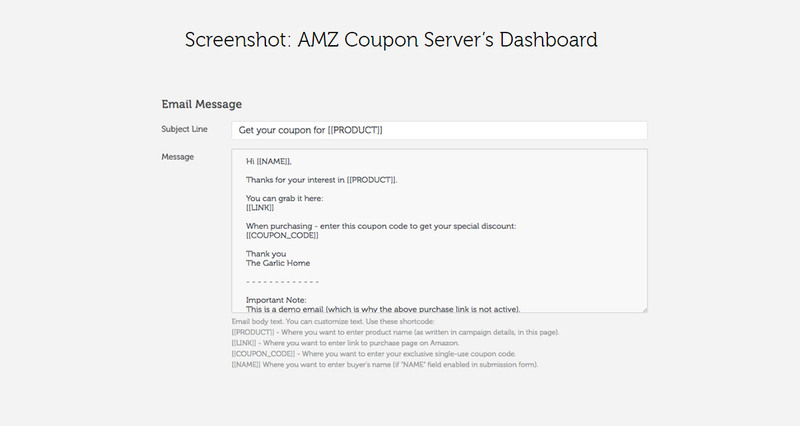 [New] An option to display the coupon code on the thank you page. Simple and quick embedding of the data collection form on any page, landing page or post in your WordPress website. 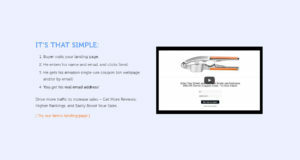 Registration form design automatically match your website design. 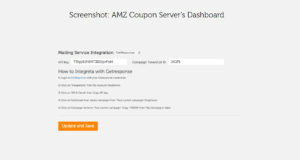 An option to immediately report any coupon sent. An option to notify you when the last coupon was sent and the campaign is over. 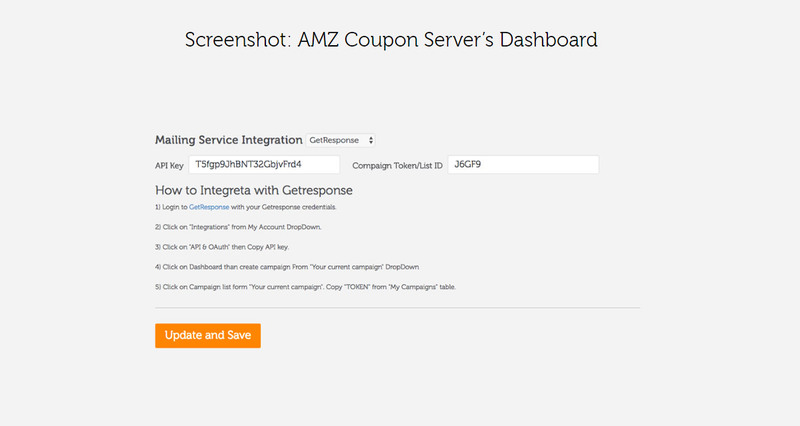 An option to integrate with leading mailing services: GetResponse, Aweber, MailChimp. [New] Transferring the fields Name, E-mail and Coupon to your mailing services. All of your e-mail addresses are collected, and downloadable as a file, for future communication with your clients. The short-code generates the submission form that in the landing page.You should build a landing page and insert the short-code to the page. 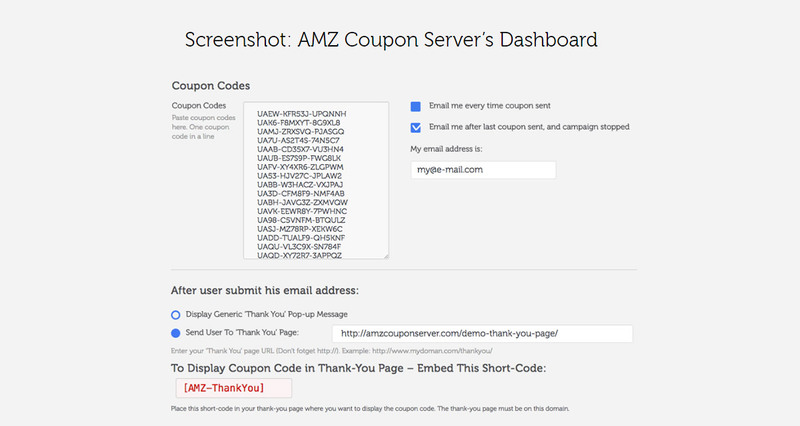 AMZ Coupon Server generates the submission form that you have to embed in your landing page.You should build a landing page and insert the AMZ Coupon Server short-code to the page. and then, send it back to a thank-you page on your WIX/Shopify/Webly website. Is there any way of adding “Name” to optin form? 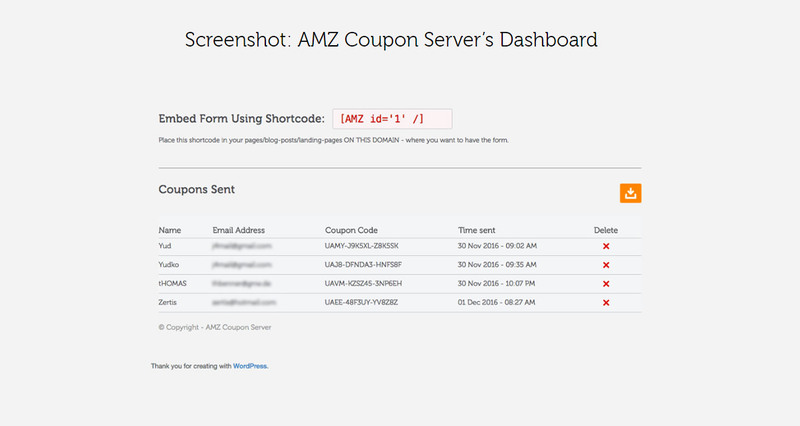 For now, there is no name field in AMZ coupon server. Sometimes, when plugin not working – it’s because of installing problems.Please de-activate and un-install AMZ Coupon Server,and then re-install and re-acrivate it. 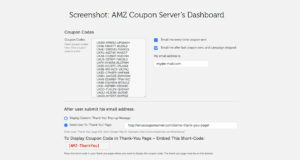 We don't have wiki content for AMZ Coupon Server yet. Are you familiar with AMZ Coupon Server? 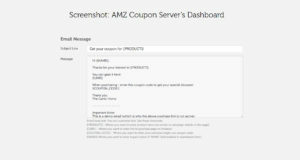 Please quickly share in your own words what AMZ Coupon Server is all about! 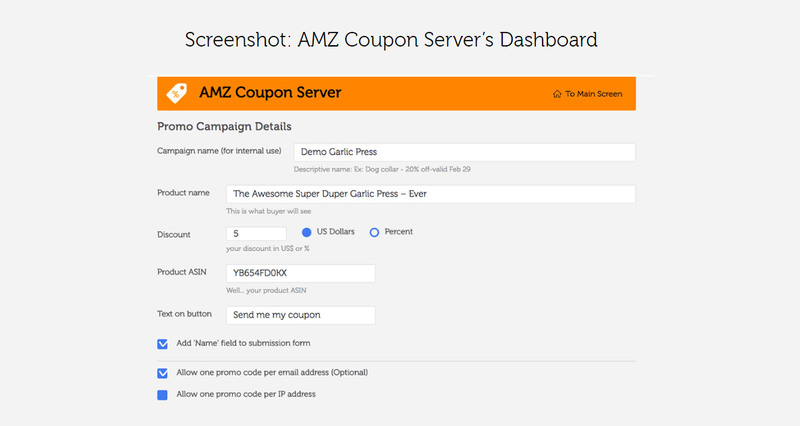 Share in your own words what AMZ Coupon Server is all about.